Hi, everyone! Reiko here and today I made a flip flap book decorated with Altenew’s floral washi tapes. I love making flip books because it’s easy but still very cute. I used some 6×6 paper pads and washi tapes here. First, to connect each 6×6 paper, I cut the Watercolor Strokes Washi Tape at 1/3 of the width and adhered it on where the picture above shows. Then I adhered different floral washi tapes on white paper and cut out each of the flower images. The products that I used are listed below. For the front page, I made it simple and used the Painted Fantasy Washi Tape. All the pictures I used for this flip book were taken in Australia where we lived 10 years ago. While we were there, we traveled around places where we had so many fun memories. Such a pretty little album! and I love that wide wash tape! 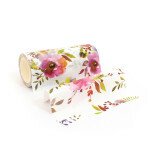 Altenew washi tapes are awsome! Hope you enjoy them. Hope you can get them soooon!!! I love using them on my layouts and minibooks, too.